The new Western Digital WDA4NC80000N ‘ShareSpace’ Networked attached storage is a device that’s designed to help power up the SOHO NAS storage arena. For those looking for a compact, yet powerful NAS, it seems to be one of the better choices in the market. With fast Ethernet and support for up to 8 TB of storage, it’s something that many will want. At the minute, the SOHO NAS storage arena is filled with under-performers. Western Digital’s latest contender, the WDA4NCxxxxx series of devices aim to capture a market that’s been widely contested for a few years now. 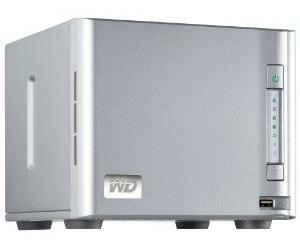 Upon unboxing the WDA4NC we were initially presented with what looked like a very sturdy NAS device. If Western Digital can apply what they know about hard drives to this NAS, then this should be a champion. With a proprietary Linux operating system operating LVM and Samba to basically power the box, we were pretty ambivalent at first due to the fact that the operating system gets loaded to the drive at first boot. This means that if you’re on a RAID 1 set up (striping) disk failure ultimately means O/S failure and a necessary reset. On larger models with more than four hard disks operating RAID 10, this is not a problem. Looking at the device, it seems well-built and the software that it ships with (MioNet) allows you to access it from anywhere. Essentially it acts as a media / storage server offering up streaming and remote access. With an FTP server, DLNA and iTunes server support – the Western Digital ShareSpace is a well-connected device. For businesses, Western Digital also provides UPS compatibility allowing graceful shutdowns in the event of a power outage as well as Active Directory support thanks to Samba. While there are a few minor limitations due to this Linux implantation, it’s no problem for an experience technical administer to get set up and running over a small workgroup. This device really does shine for small businesses that need a central server, but without the cost and hassles of having to buy a ‘real’ server. 4 drives, up to 8TB Supported. After testing the device for a while, read and write speeds were well within accepted norms. 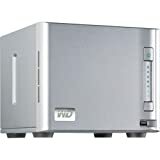 It’s clear that Western Digital have marketed the ShareSpace for both businesses and home users, as this device will perform well in virtually any setting. From a home user’s perspective, the only drawbacks we noticed was lack of Bit Torrent support, but the software does include a full HTTP downloader. For businesses purposes, this device can be setup as a four drive RAID 5 array offering both great performance and redundancy in case of failure. This drive is well suited to just about anyone that’s got moderate PC experience.